If you're new here, welcome. The Green Light Dhaba is Delhi's only "virtual dhaba." We serve up fresh thinking on the environment, the economy, and justice every Tuesday and Thursday. Because we are new, we've also been working weekends. But the guys and I really need a little time off. So we came up with the idea of a "Saturday Special." On Tuesdays and Thursdays, you'll still get a full menu of fresh thinking and a place to sit and talk. On Saturday's we're going to try a new format: snacks and leftovers. In the snacks section, you'll find short bits and links that we just weren't able to work into the main menu. Some of them may turn into longer pieces in the future, and some of them are just for fun. If you have ideas for material we could use in this section, please do let us know. In the leftover section, we have the best of the Green Light Dhaba, for those of you who might not have seen it all. Just one more thing, before we bring out the menu. We are a new here in cyberspace, so we need all the help we can get. If you like what you see, please give us a shout out, blogroll us, tell your friends, etc. Melting Man: Street art with a message. Photos by Han Bing, who is coming to Delhi in the Spring. Trudie Styler is a hypocrite! Thanks to Wordjunkie for sending this our way. Yep, Trudy's a Brit, so you can't say we only make fun of the Americans. A base on the moon is not enough for the Indian Space Research Organization; now they want to buy a space taxi for space tourists. Will we see Shah Rukh Khan in orbit by next Republic Day? If we don't figure out how to treat women, is it possible to solve anything else? Here's Akhond of Swat on "Eve Teasing". For those of you who enjoyed the Story of Stuff, Bhagwad takes a look at the economy behind your plastic bag. 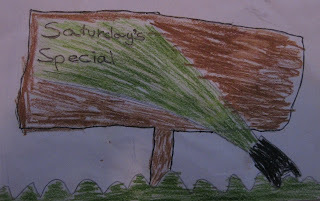 Let us know what you think of the Satuday Special, and we hope to see you back here next week. @Bhagwad--Ha! I confess, you are right. I have one of those 15 rupee rough copies you can get in any Delhi market. Mine has a stylized drawing of some animals on it.